Julius Campbell, former captain for the 1971 championship-winning T.C. Williams High School football team, died on Jan. 25 due to organ failure. He was 65. Campbell leaves behind a legacy defined by his athleticism and decades-spanning work fighting for racial equality and harmony. “Julius brought the kids into an era of unknowns in terms of race relations, and he made them talk with each other,” Herman Boone, the Titans’ coach from 1971 to 1979, said. Campbell was born on Dec. 5, 1953, to Hazel and Julius Campbell Sr. He arrived at T.C. Williams in 1969 standing more than six feet tall, weighing close to 230 pounds and ready to take the field. “He was intelligent, he was fast, he was big, and he had tremendous intuitive skills,” Boone said. Campbell was a defensive lineman, and his ferocity on the field was matched by his friendly, gregarious and good-humored attitude off the field. There were two sides to Julius Campbell: a grizzly bear and a teddy bear, according to Boone and Campbell’s teammates. “When he put that helmet on, he was a terror. When he took that helmet off, he was the nicest guy,” Randy Phillips, Campbell’s teammate and former Titans’ offensive lineman, said. The true test of Campbell’s athletic ability and character, however, came during the 1971-1972 season, after the city moved all high school juniors and seniors into T.C. Williams, creating a potent combination of racial tensions and school rivalries. “[Players] all had to compete to make respective sports teams when they had competed against each other in prior years,” Bill Euille, former Alexandria mayor, T.C. Williams alumnus and Campbell’s friend, said. The T.C. 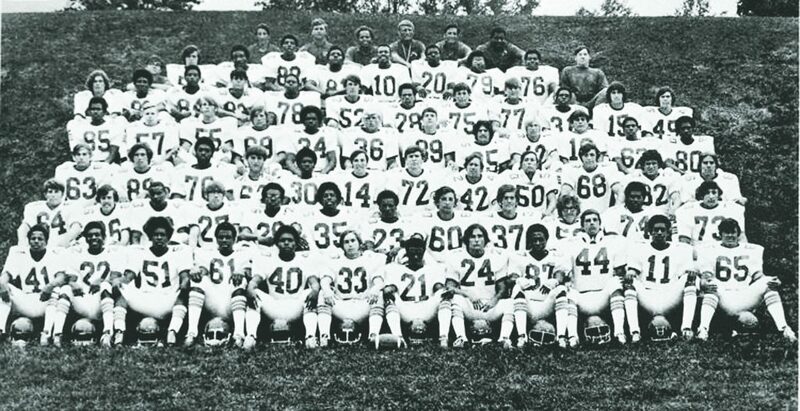 Williams Titans football team is shown in a yearbook photo taken during the 1971-972 football season. Defying expectations, Boone, who is black, became the coach for the new Titans team that season. Bill Yoast, the coach at Hammond, who many assumed would step into the position in part because he was white, became a member of Boone’s staff. At a time when racial tensions had reached a fever pitch, the choice of Yoast as an assistant coach provided a path for white players who were reluctant to join a team with black players and a black coach. In order to get the team out of its pressure-cooker environment, Boone took the players to Gettysburg, Pennsylvania for two weeks. Coming out of that two-week training session, Campbell and linebacker Gerry Bertier, who Campbell became very close with, stepped up as leaders. Campbell worked with his teammates to set aside their differences and come together as a team, Boone said. He coined the phrase, “A team is a group of people with one vision, one objec- tive and one heartbeat.” It was a mantra for the team and a philosophy that went beyond the football stadium. “That resonated not just with the football team but the students as a whole and faculty and actually the city of Alexandria,” Euille said. The Titans went undefeated that season. They had nine shutouts and won the Virginia AAA State Championship against Andrew Lewis High School, 27-0. After graduating from T.C. Williams in 1973, Campbell attended Ferrum Junior College with dreams of eventually playing foot- ball at Ohio State. However, he suffered an ankle injury that cut his college career short. Campbell wound up leaving Ferrum to care for his father. Campbell then pursued another passion of his — animals — and worked for Alexandria’s animal control department. Campbell’s fascination with wildlife was well known in high school — along with his puckish sense of humor. Boone recalled Campbell prowling the hallways of T.C., pockets full of garden snakes which he would release in Boone’s office. “I knew it was him because he would come into practice and be laughing all day long,” Boone said. Later in life, Campbell served as vice president of the 1971 Original Titan Scholarship, which was established in 2002 to help T.C. Titans with financial need afford college. He also continued the work he had started as a Titan by giving talks at schools throughout the area, recounting his team’s story and the importance of combating racism and bullying. “We’ve lost a tremendous human being. We’ve lost a tremendous asset to this city,” Boone said. Campbell is the third prominent member of the ’71 Titans team to die in recent years. His death follows those of Darryl Stanton, who passed away on March 16, 2017, at 63 following a car crash, and Lewis Lastik, who died on April 14, 2017, at age 62 after an undisclosed illness. Campbell is survived by his wife Cathy Campbell, his daughter, three stepdaughters, two stepsons and five grandchildren.